To the outsider, a major motivation for Tipperary in this Sunday’s Allianz Hurling League final must surely be the fact that it’s in Kilkenny — beat the Cats in their own house? What a boost that would be as they head into the Munster championship! For Brendan Maher, however, that’s a mere sideshow. A league title, that’s what Tipperary are after, and everything else is secondary. “Hands down, yes. I don’t have a League medal, it’s the only medal I’ve failed to win so far (part of an all-conquering underage squad, Brendan has All-Ireland minor, U-21 and senior, along with Railway Cup, Waterford Crystal etc. etc). It’s funny though how fortunes can fluctuate. As rapidly as Brendan’s own graph was rising while Tipperary were winning all those titles, it all suddenly ended. 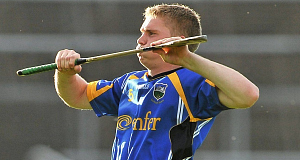 The All-Ireland senior final of 2010 was the pinnacle, Tipperary ruining Kilkenny’s dreams of a record five-in-a-row in spectacular fashion, Brendan ending with an All Star award and the Young-hurler-of-the-year award. Tipperary also went on to claim that year’s All-Ireland U-21 title. 2011 was when it all started to go wrong for Tipperary and for Brendan himself especially. A freak ankle-break at his home in March 2011 started the slide and though Brendan did make it back before the end of the season, both that year and last year were virtual write-offs as he struggled to rediscover his form, his confidence and above all, a regular place on the team. Where he had been an All Star midfielder, now he was a utility man. “That was one thing that I struggled with after I came back from the injury — I was used as cover in positions because, I suppose, I’m versatile. I was seen as cover for the half-back line, full-back line, midfield and even the half-forward line. It was one thing that I discussed with the management — I would like to have one or two positions. The doubts that haunted him since the injury are all well behind him now, his form back to where it was in 2009 and 2010, hurling again with a cultured assurance. He and Tipperary are going to need that confidence this Sunday, that assurance. Nowlan Park even on an ordinary league day has the aura of the coliseum about it but a league final? Even the merest hint of fear and the Kilkenny players — not to mention the supporters — will smell blood. “The fact that it’s a smaller stadium makes the atmosphere more intense, the crowd is closer to you.